All Web addresses mentioned were functional as of 3-18-16. From the Cumberland Gap to the Atlantic Ocean, this is Virginia Water Radio for the week of March 21, 2016. This week, music from the Harrisonburg, Va.-based band, The Steel Wheels, captures some of the “fever” of spring, which begins astronomically in Virginia this week. Have a listen for about 40 more seconds. You’ve been listening to part of “Until the Summer Comes,” from The Steel Wheels’ 2013 album, “No More Rain.” Water is part of spring’s feverish pull for this song’s narrator and for many non-humans, like Spring Peepers and American Toads [SOUND ~ 3 sec] seeking temporary ponds for breeding; Red-winged Blackbirds [SOUND ~ 1 sec] nesting in wetlands; and—to humans’ dismay—mosquitoes [SOUND ~ 1 sec] seeking all kinds of standing water for egg-laying. 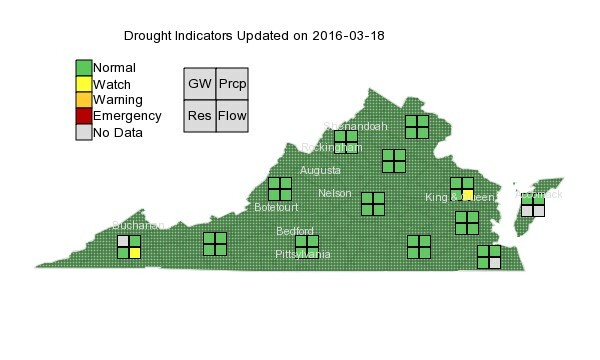 As of March 18, 2016—just before Virginia’s spring equinox on March 20—water was relatively abundant in the Commonwealth, with no current signs of drought, according to the Virginia Drought Monitoring Task Force, and stream flows over the previous 28 days at normal levels or above, according to the U.S. Geological Survey. Let’s hope that water adequacy holds true well beyond when summer begins astronomically on June 20, for the sake of kids in creeks, frogs in ponds, birds in wetlands, water supplies in reservoirs, plants in the ground, and countless other aquatic connections—including water images in music. “Until the Summer Comes,” by The Steel Wheels, is from the 2013 album “No More Rain,” used with permission. More information about The Steel Wheels is available online at http://www.thesteelwheels.com/. Two early spring views of shimmering ponds in Blacksburg, Va.: upper photo - a temporary pool and and adjacent wetlands where several kinds of frogs breed and Red-winged Blackbirds are common, April 4, 2015; lower photo - part of Virginia Tech's Duck Pond, March 21, 2016. Deborah Byrd, “Everything you need to know: Vernal equinox 2016,” EarthSky, 3/16/16, online at http://earthsky.org/astronomy-essentials/everything-you-need-to-know-vernal-or-spring-equinox. National Oceanic and Atmospheric Administration (NOAA), “Meteorological Versus Astronomical Seasons,” online at https://www.ncdc.noaa.gov/news/meteorological-versus-astronomical-seasons. National Weather Service/Climate Prediction Center, “U.S. Seasonal Drought Outlook for March 17—June 30, 2016” (released March 17), online at http://www.cpc.ncep.noaa.gov/products/expert_assessment/sdo_summary.php. U.S. Geological Survey, “Water Watch,” Virginia 28-day streamflow map, online at http://waterwatch.usgs.gov/index.php?m=pa28d&r=va&w=map on 3/18/16. University of Nebraska-Lincoln, “U.S. Drought Monitor,” online at http://droughtmonitor.unl.edu/. U.S. Naval Observatory, “Earth’s Seasons—Equinoxes and Solstices—2015-2025,” online (as PDF) at http://www.weather.gov/media/ind/seasons.pdf. Virginia Department of Game and Inland Fisheries/Virginia Fish and Wildlife Information Service, “Taxonomy Chapter for Red-winged Blackbird,” online at http://vafwis.org/fwis/booklet.html?&bova=040346&Menu=_.Taxonomy&version=16878. Virginia Department of Game and Inland Fisheries, “Virginia is for Frogs” Web site, online at http://www.dgif.virginia.gov/wildlife/virginia-is-for-frogs/. Va. Drought Monitoring Task Force, “Current Drought Conditions in Virginia,” online at http://www.deq.virginia.gov/Programs/Water/WaterSupplyWaterQuantity/Drought.aspx, accessed 3/18/16. Virginia Water Resources Research Center, “Mosquitoes and Water,” Virginia Water Central, June 2009 (pages 6-15), online at http://vtechworks.lib.vt.edu/handle/10919/49357. Red-winged Blackbird Research, Episode 259 (3-30-15). 6.6 – organization and interactions of the solar system (including gravity, moon phases, earth tilt, tides, and history of space exploration).